Louisiana Eats! is a radio show for people who cook and people who love to eat well — all with a Louisiana point of view and Poppy's distinctive Louisiana voice. In each program listeners join Poppy as she meets people who produce, cook, and eat the foods we enjoy and treasure — exploring kitchens and stores, farms and waterways where favorite foods are produced and prepared. And because Louisianans love all kinds of food, Poppy won't limit herself to shrimp creole and hot sauce! 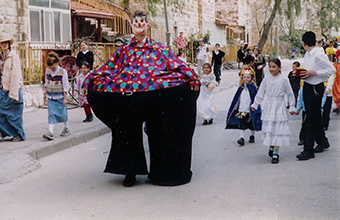 Another Carnival season is behind us, but the Jewish festival of Purim is right around the corner. First, we learn all about Purim with the help of Benay Bernstein. She provides an introduction to this joyful day – one unlike any other on the Jewish calendar. To continue, author Joan Nathan shares her knowledge of global Jewish foodways. As she tells us, the Jewish diaspora even reached the Mississippi River -- to Louisiana’s early Jewish settlers. Next, we hear from Michael Twitty. He's a writer, culinary historian, and Judaic studies teacher who's dedicated to drawing connections between African and Judaic food traditions. We also get into the Purim spirit by talking to cocktail writer Noah Rothbaum of The Daily Beast. In a series he calls "Jews & Booze," Noah examines the role that Jews have played in popularizing distilled spirits. And we finish up with Joyce Goldstein, author of The New Mediterranean Jewish Table. Joyce discusses the diverse recipes of Sephardic Jews.